Flowering vine is beloved by gardeners across the country, and for good reason. Climbing vines that produce blooms and striking foliage can add beauty to otherwise plain structures and yards. Vine can also provide your home with extra privacy, which is one of the best qualities of these plants! 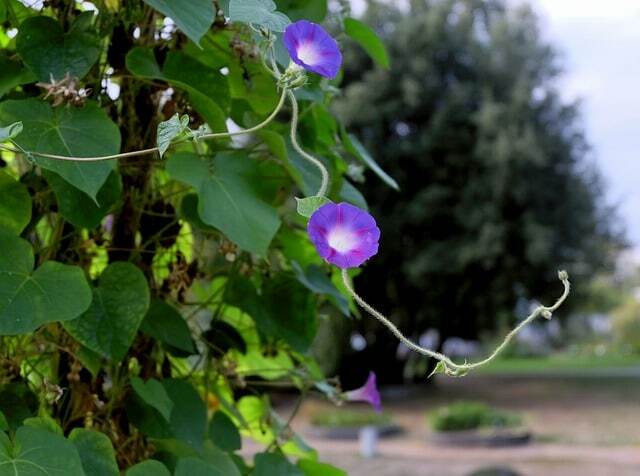 Contrary to popular belief, climbing vine isn’t that difficult to grow and care for, and it’s not a plant that only gardening veterans should try their hand at. In fact, many flowering vines are low-maintenance perennials that require very little to thrive. If you’ve been looking for a way to decorate your fence, trellis, pergola, or porch, a vine may be your answer! Let’s take a look at your options below! (This post may contain affiliate links). 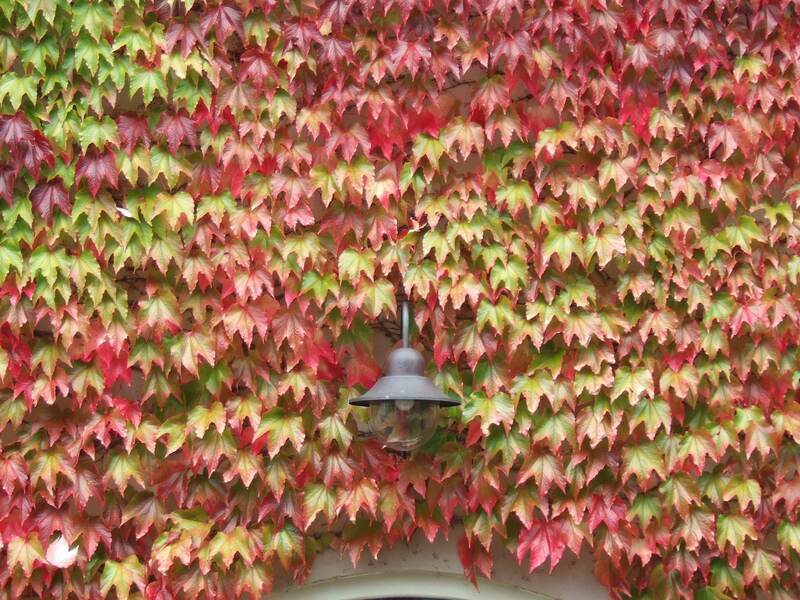 If you love autumnal colors that make you think of Fall in Vermont, then you need some Veitchii Boston Ivy in your garden! Come Fall, this vine will produce deep shades of auburn, brown, and orange with its big beautiful foliage. Boston Ivy grows well in zones 4 to 8. Plant it in full sun or partial shade, and keep the soil moist. Grow it on a pergola, fence, or trellis. Make sure you prune it properly! 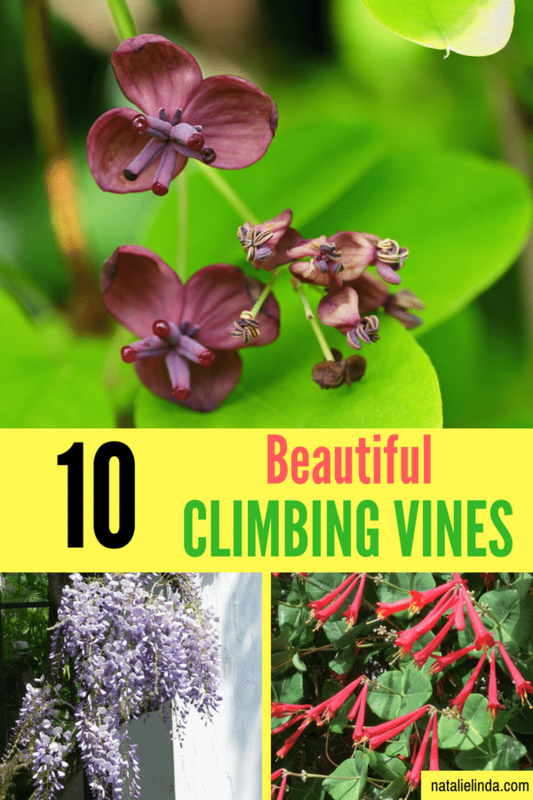 You might be familiar with hydrangea bushes but did you know there’s a climbing variety, too? 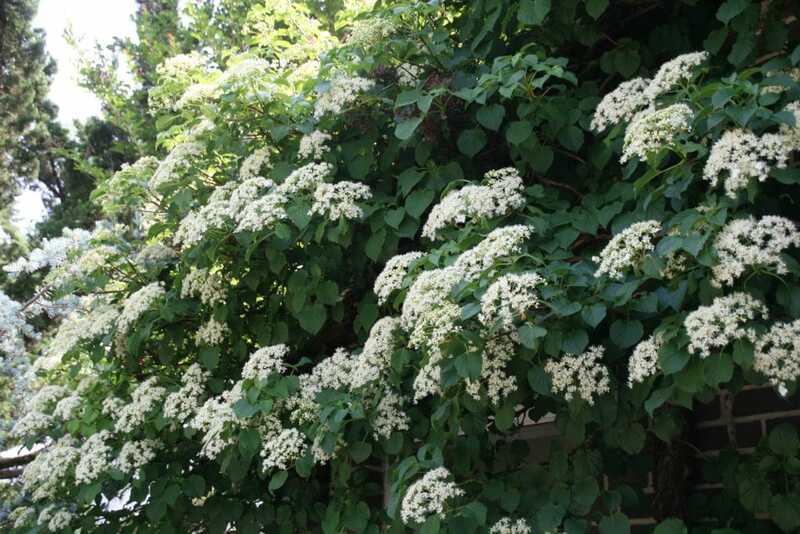 Climbing hydrangea grows well in zones 4 to 8 and blooms from May to July. Make sure to plant it in full shade to part shade. This sprawling woody vine thrives in rich and fertile soil and can spread up to 30 feet long! Grow climbing hydrangea if you like the look of large clusters of white blooms against deep green foliage. 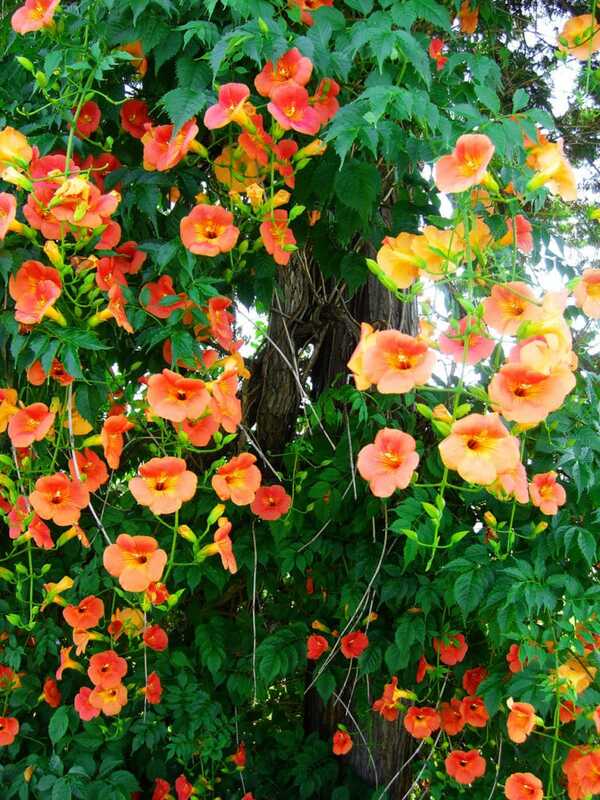 If you’re drawn to trumpet-like blooms then try growing trumpet vine in your yard! This fast-growing perennial vine is beloved by hummingbirds and blooms from Summer to Fall. It’s hardy in zones 4-9. Trumpet vine can be invasive if left unpruned, so make sure you learn when and how to prune this plant. It is very low-maintenance and can survive cold winters and less-than-ideal soil. Water it when the soil is dry and don’t bother fertilizing it – it won’t need it! Wisteria is one of the most well-known vines, and the most vigorous, too. It’s known for its invasiveness as well as its large clusters of delicate lilac-colored flower petals. If you plant wisteria, you need to be committed to pruning it, otherwise, it’ll end up overtaking your house or yard. If you prune it correctly, however, you’ll be rewarded with fragrant blooms that add endless character and a peaceful quality to your home. For detailed information on how to grow and care for wisteria, check out my detailed post here! Clematis is beloved by those who grow flowering vines because there are so many varieties to choose from. In fact, there are more than 300 different types of clematis flowers, which gives you the opportunity to choose which one you like the most. Make sure to research which variety grows well in your zone, too. Plant your clematis in a spot that gets 6 hours of direct sunlight, and use a strong trellis for support. Provide it with moist, well-drained soil that isn’t too acidic. To learn how to grow clematis vine, click here! 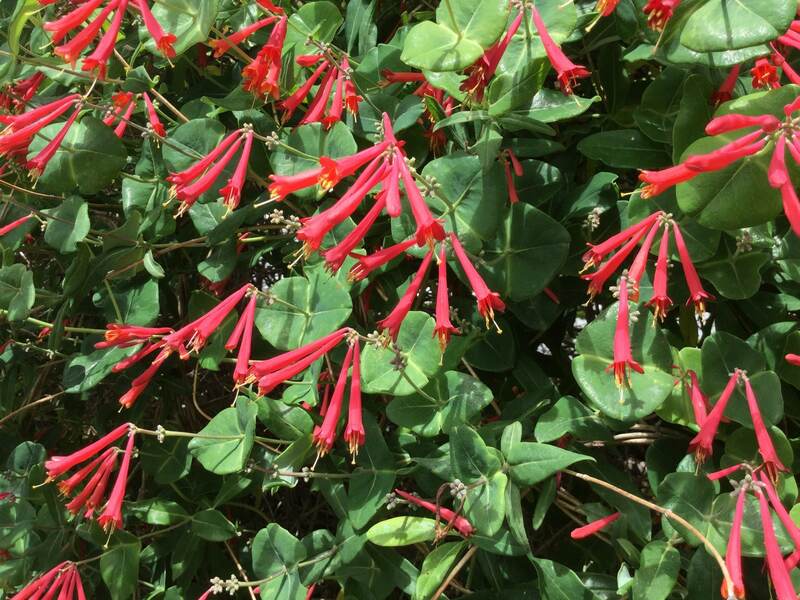 If you crave an exotic-looking vine, then coral honeysuckle is your best option. It thrives in zones 4-11. Its interesting clusters of trumpet-like narrow blooms would look especially unique in even the starkest of yards. This fragrant vine is also an excellent option if you’re looking to add fragrance to your garden. The good news is, it’s not an invasive vine! This means you won’t have to worry about it overtaking your yard or commanding too much attention. Plant honeysuckle in full sun to part shade and grow it along with a trellis or fence for support. Like jasmine, it works well as ground cover, too. Moonflower is known for its large white or purple blooms and for its sweet fragrance. Moonflower effortlessly grows upwards as long as it’s supported by a trellis. This vine will need to be watered regularly. To encourage large blooms, make sure to fertilize. However, as with most plants that produce flowers, using a fertilizer with too much nitrogen will kill its chances of flowering. 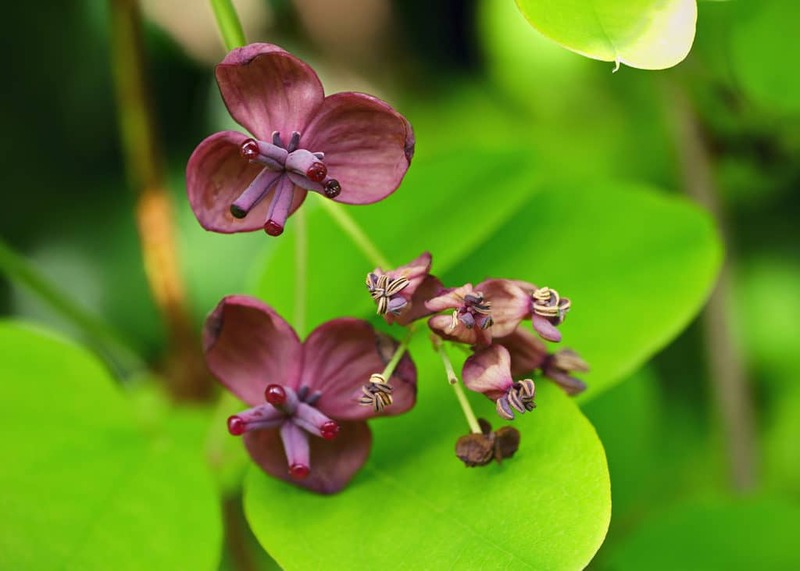 Chocolate vine produces purple-brown flowers that are rather hardy. Add this fragrant perennial to your fragrant garden in the Fall or Spring in average soil. It’s resistant to drought so it won’t require much watering; once a week is all it will need. Chocolate vine grows vigorously and doesn’t need a lot of fertilizer, which makes it one of the most low-maintenance vines. Purple Bouquet is the most popular variety and the least invasive. Jasmine is often grown as a ground cover but it can be a beautiful climbing vine, too. 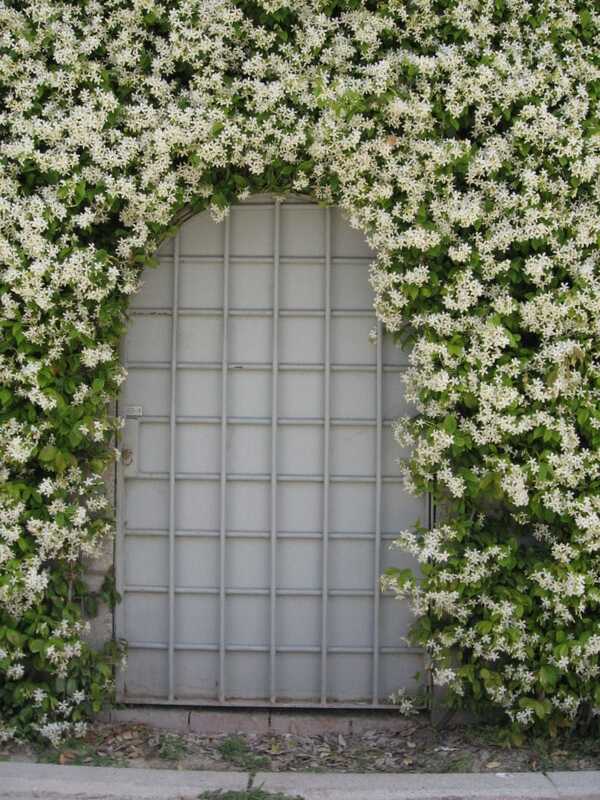 If you have an unsightly fence you want to cover, I recommend jasmine. It grows brilliantly on a wire and its deep-green foliage and stark white flowers make the most excellent backdrop for photos! Plant jasmine in the Spring or Fall and provide it with moist, fertile soil. If you’re looking for a fragrant vine for your yard, this is it! You can’t beat the jasmine when it comes to fragrance. 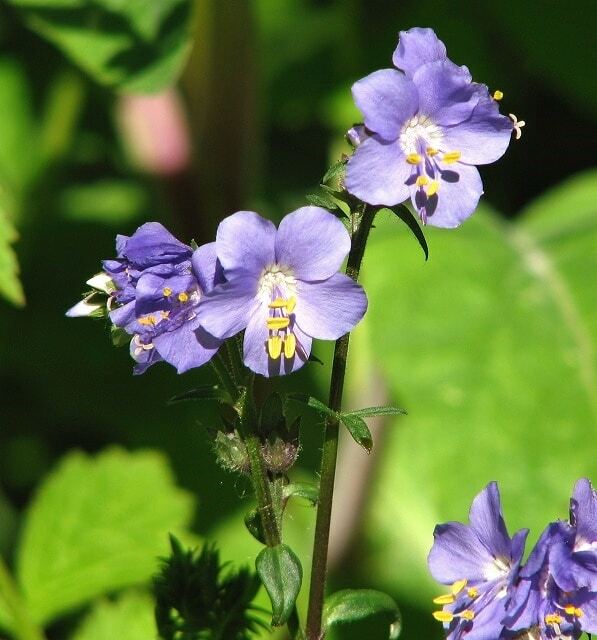 Jacobs ladder is a striking vine that’s hardy to zones 3 to 8. If you crave deep-blue blossoms in your garden, then the Bambino Blue variety is for you. It produces some of the most beautiful blooms imaginable during Spring and Summer. You can aslo find Jacobs Ladder in various shades including purple, pink, white, and yellow. This vine thrives in shade to partial shade and moist soil. Now that you know which vines grow perfectly on a trellis, fence, or pergola, you can decide which one to grow based on your needs and your hardiness zone. If you’re looking to grow a low-maintenance garden, read about perennials here, and sign up to my newsletter below to get your free ebook on low-maintenance flowers! Just beautiful! I love all the choices.